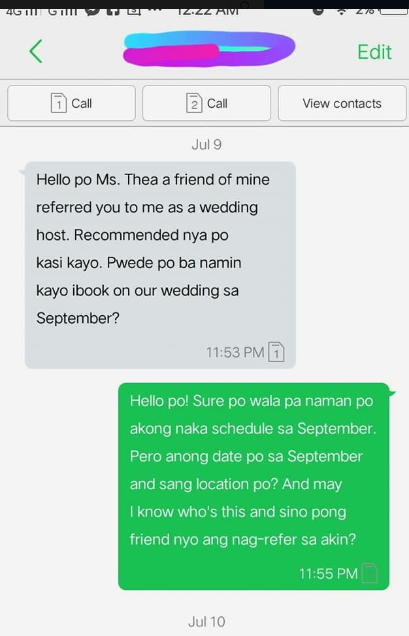 Home / Trending / Client refuses to pay for wedding host's accommodation and talent fee: "For sure di ka naman magaling eh"
Client refuses to pay for wedding host's accommodation and talent fee: "For sure di ka naman magaling eh"
Facebook user Althea Español Leonen, on July 10, shared her personal experience through a post about her prospective client who refuses to pay for her accommodation and also her talent fee as an events host. In her post, Althea started off by saying that she never thought she would experience the bad treatment herself. “Earlier this morning I was reading the posts about this type of conversation. Little did I know I myself will experience this.” Althea stated. “We invest for our skills, plus pagod sa pagdadala nang weddings and our efforts to doll up and dress up. Di naman ako after sa TF lang pero sana makita ung value namin as events host. We invest for this skill. Di naman po ako basta pinahawak lang ng mic then naging host na. Nakakalungkot na may ganitong mga tao.” She added. The event host included her screen-capped conversation with the supposed client, who texted her and said that she was recommended by a friend. The client then informed her that the wedding will be on September 15, in Batangas and that rooms were already booked for the couple and the entourage. Althea was told to book a room for herself as the event will be a sunset wedding. Althea then asked if the client will be the one to book a room for her. She was told that they can reserve a room for her, but she has to pay for it at the hotel and that they can only provide for transportation and recommendations in return. Althea, in response, told the client that she could only do free hosting if she’s doing it for a friend. She also said it was a bit unfair for her to not receive any compensation for her hard work and effort that even her friends would not let her empty handed. The client then throw insults at her, saying that she will not become famous. “for sure di ka naman magaling eh. Magkano lang din naman ang TF ng mga host e.” the message reads. Althea informed the client that the minimum fee for a wedding host is around 5, 000. She then refused to host the event. On her post, Althea also clarified that she’s not trying to be famous and she just wants to share her talent and skills by being a blessing to those who will get married. “Wala naman po akong hangad na sumikat. I just want to share this talent and skills and be a blessing sa mga kinakasal. I guess gaining a little profit from hosting is not that bad.”Althea said. This post from Althea went viral already, it now has almost 6 thousand shares, 15 thousand reactions and a lot of comments from netizens since she posted it yesterday morning.